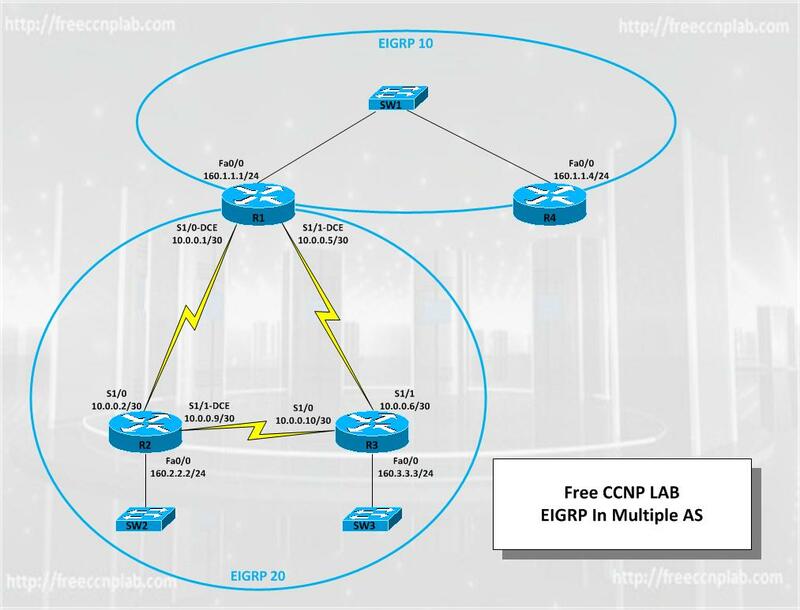 In this Free CCNP Lab you will learn to configure EIGRP in multiple AS. You will also learn to configure path control and stub routing using this topology created in GNS3. Finally you will use Cisco show, ping and traceroute commands to test and verify your configuration. Understand EIGRP implementation in multiple AS. Configure Multiple AS EIGRP in Cisco IOS routers. Understand and configure path control and stub routing. Configure hostnames, console and enable password. Configure IP addressing on all routers as illustrated in the network diagram. Configure EIGRP for AS 10 as shown in the network diagram. R4 should be configured as an EIGRP stub router. R4 should NEVER advertise any routes. In addition to this, ensure that router R4 will only ever receive a default route from R1 even if external routes are redistributed into EIGRP 10. Configure EIGRP for AS 20 as illustrated in the network diagram. Verify your configuration using the appropriate commands for EIGRP. Configure EIGRP so that R4 can reach all other routers in the network and vice-versa. Ensure that only the 160.1.1.0/24 is allowed into the topology table for EIGRP 20. Verify your configuration and also ping to and from R4 from the 160.2.2.0/24 and 160.3.3.0/24 subnets. Assume that the WAN link between R1 and R3 is unreliable and should only be used when the WAN link between R1 and R2 is down. However, an EIGRP neighbor relationship should still be maintained across this link. Configure EIGRP so that neither routers R1 nor R3 use this link unless the WAN link between R1 and R2 is down. You are only allowed to configure R3. Do NOT issue any configuration commands on R1 to complete this task.